Obadiah's has partnered with High Valley to bring you the 1500 series, 1/8" solid plate steel, Wood Burning Insert, with large, high impact ceramic window provides an unobstructed view of the fire and adds an aura of warmth to any room. This unique wood insert has the ability to be installed as a Zero-Clearance Fireplace with the optional ZC Cabinet Box. A large 2.5 cu. ft. firebox allows for longer burn time and heats up to 2,000 sq. ft. Engineered standard with Catalytic burning technoglogy, in which the smoke is reburned in a catalyst device for cleaner emmisions. High-Efficiency Catalytic Wood Burning models reduce the amount of combustion particles produced in the air, providing you with clean, breathable air. High performance in a small package, Obadiah's stove line by High Valley is designed with a unique combustion system reburn tubes in the upper firebox. Creating a beautiful and viewable large dancing flame through the expansive ceramic glass, with bonus bay windows. The model 1500 wood insert and 1500zc Zero Clearance Fireplace is available in a variety of color finishes, trivet packages, and door colors, making it veristile to fit any contemporary or traditional style decor. 8" - 6" Flue Reducer - Safely reduce the 8" to fit your standard 6" flue. 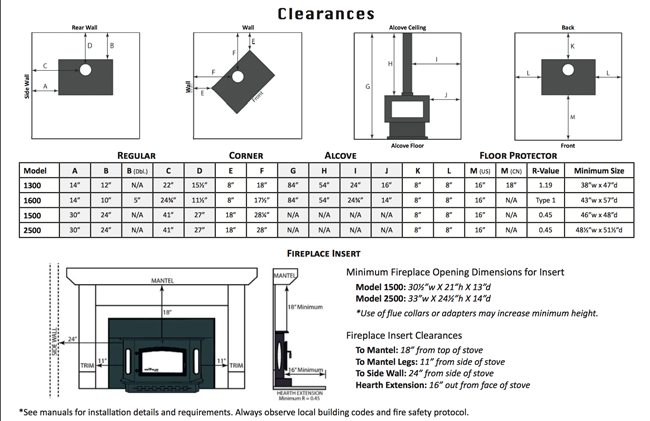 Choose from four surrounds for your Obadiah's 1500 wood insert or 1500zc Zero-Clearance Fireplace. The Victorian Arched Surround and Traditional Surround include both a unique surround and special accents on the stove itself. The Flat Fit Surround and Standard Surround are surrounds only. Custom size, arch, and custom designed surrounds are also available. Each one is laser-cut from a single sheet of steel for perfect fit. Add special finishes like Hand-Rubbed Copper and Hand-Rubbed Bronze for a special accent. Firebox Volume 2.5 cubic ft. Floor Strength must support at least 600 lbs. ** Residential, curbside delivery via freight truck with a lift gate is a $100 upcharge for shipping in the Continental U.S.A. and some parts of Canada (some exceptions may apply). Please inquire with our sales staff if you have specific shipping needs such as international, freight terminal and/or business deliveries or if you need a smaller truck size. Click here to see Obadiah's Shipping Terms. Residential, curbside delivery via freight truck with a lift gate is $100 charge for shipping in the Continental U.S.A. (some exceptions may apply). Please inquire with our sales staff if you have specific shipping needs such as international, freight terminal and/or business deliveries or if you need a smaller truck size. Click here to see Obadiah's Shipping Terms. Obadiah's offer's a 15% discount and free shipping on most complete chimney systems. Contact our chimney specialists for an exact quote.